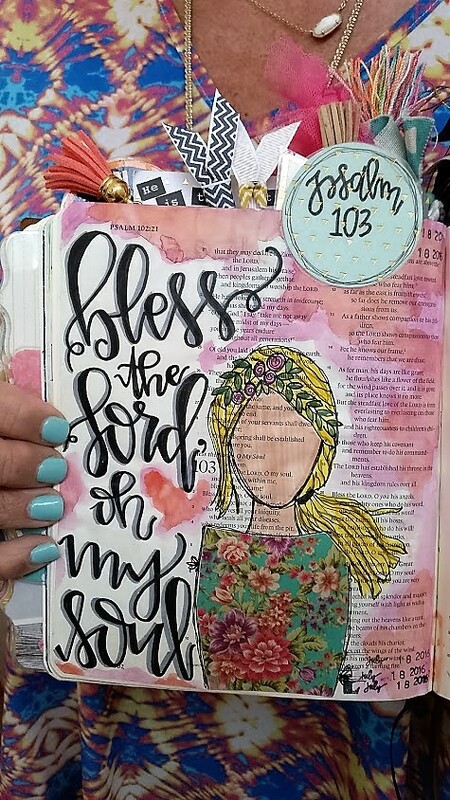 I took my first Bible journaling class at LifeWay bookstores in January when I made the resolution to use 2016 as my year to learn new things. The class peaked my interest to start a Pinterest board on the subject and take more in-depth class. 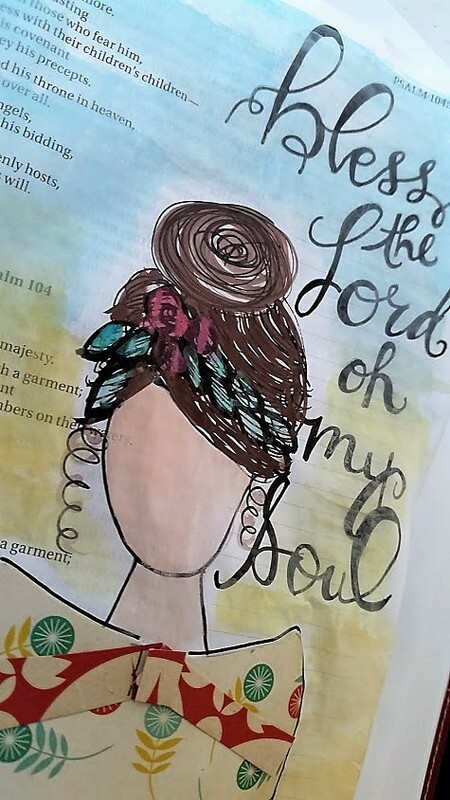 If you search Bible journaling you will find tons of great resources. I had no idea there is a growing movement to express your creativity while you are reading the Lord’s word. What an awesome way to combine both of your gifts! My friend Terry hosted a class in her home on Sunday afternoon. First of all, Terry’s house is one of my most favorite places to hang out. She is a wonderful hostess and an excellent cook. Her home looks like something out of Architectural Digest. So, even if we were going to be decorating paper bags, I knew I had to go so I wouldn’t miss the fun and her fab cooking. 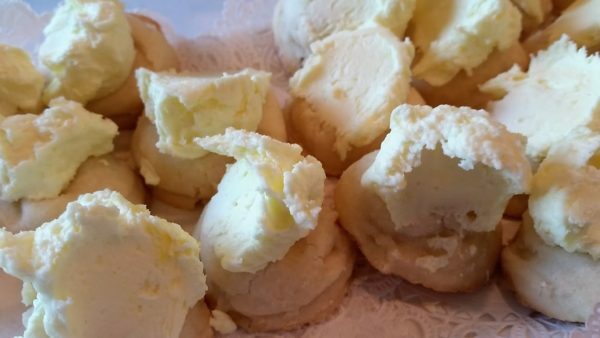 Buttery, lemon thumb print cookies that melted in your mouth. I ate one and looked through her cabinets for a baggie to take one home. 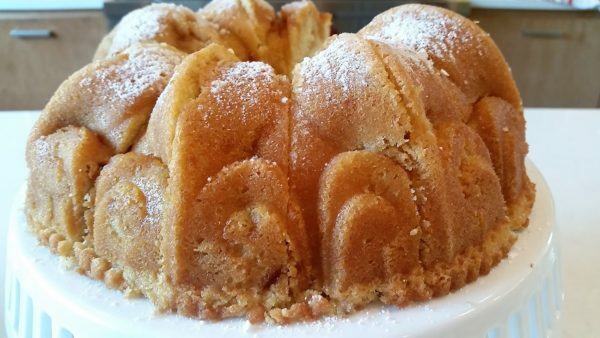 Peach poundcake. I didn’t eat a piece, but I took one home. 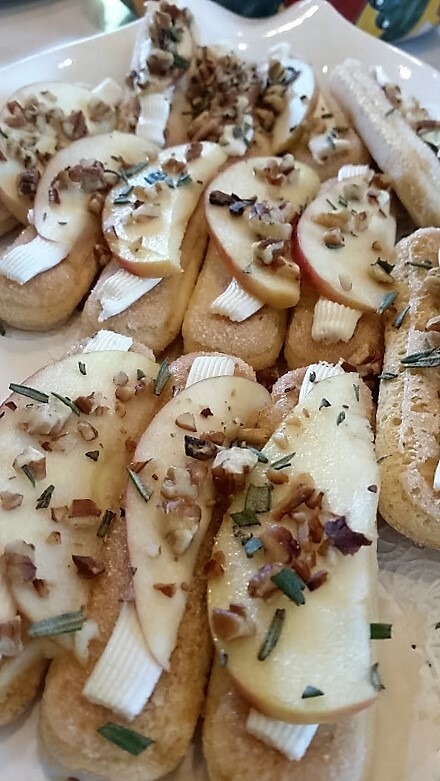 Lady fingers with a wedge of apple, cheese, a drizzle of honey and sprinkled with chopped rosemary and pecans. Ditto. Didn’t eat. But, took one home. Last, she had plates of fruit and cheese. 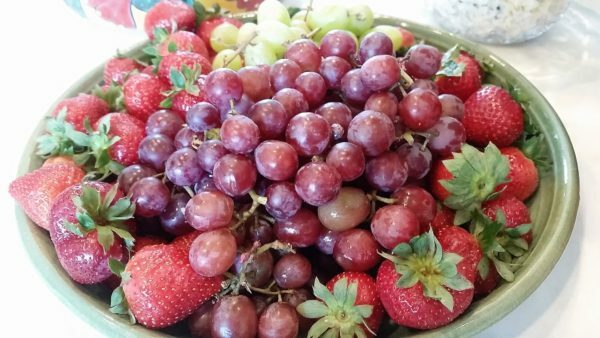 Terry can make fruit look like a million bucks. 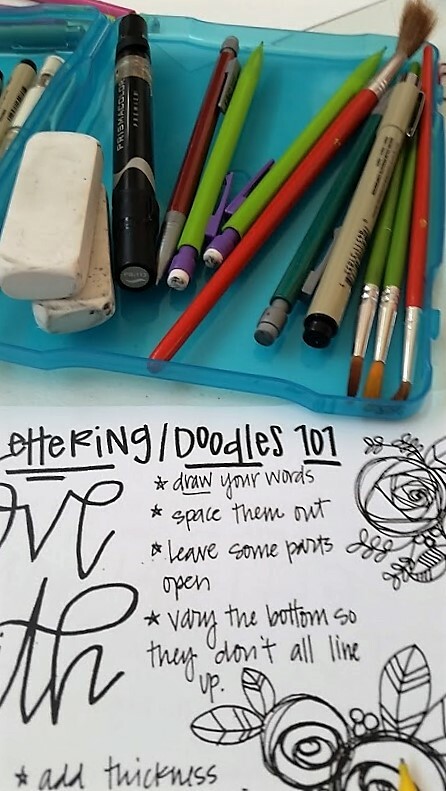 The class was lead by the talented and beautiful, Kaylee King, from We Three Kings Illustrated (she’s on Facebook, Instagram and Periscope). For $35 she led a 3-hour class on tips, tricks and how to’s. First, she went through the supplies we were going to use. She sent us home with a list of her favorite Bible journaling supplies. Each of us brought a journaling Bible to the class. You can easily find them in most bookstores and online. 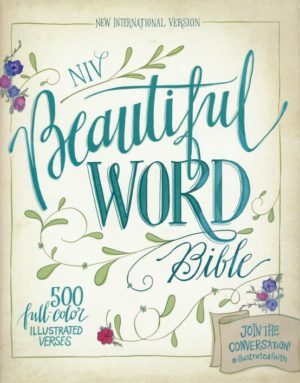 I chose to use the NIV version of Beautiful Word Bible which already has pages with illustrated verses to get you started. Journaling Bibles are set up in a different format to allow empty space for drawing and taking notes. 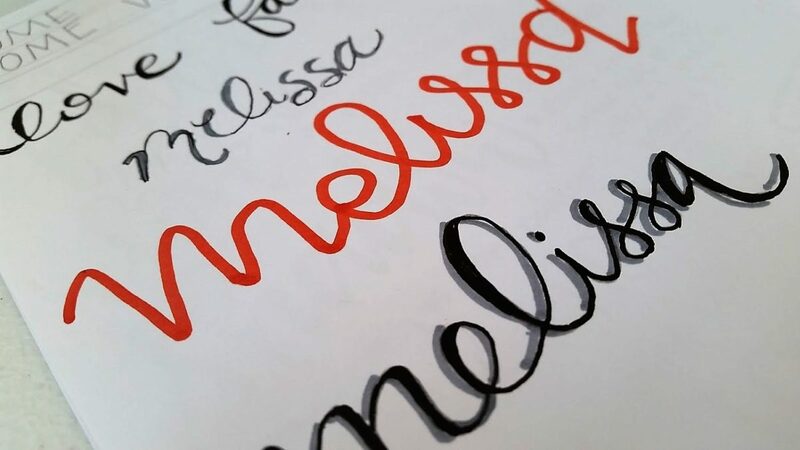 Then we spent time lettering and once we felt comfortable we moved to re-creating this work of art Kaylee showed us as an example to do in our Bibles. There are no right or wrong ways to do this. It’s merely an expression of your imagination. Kaylee walked us through cutting out the girl’s dress with scrapbook paper, how to draw the face and the hair. Then we penciled our wording into the Bible and went back over everything with a fine-point liner. She showed us how to wash the page with watercolor. Last, we finished with a date-stamp so we will know when we completed our work and be able to see how our skills grow over time. It was such a sense of accomplishment when we were all finished. The Lord delights in seeing His people gather together to celebrate His name! Thanks for sharing on what was a great and creative afternoon spent with friends! Thank you for opening your home for our group to learn! It was grand. So sweet! I so enjoyed meeting you and love your blog! I’ll be following regularly!! Thank you Kaylee. I can’t wait to add more pages to my Bible. How fun! It was great meeting you. Loved you post and your page. I enjoyed meeting you Autumn as well. I hope we see each other again soon! I love how your page turned out:) what a neat workshop! Thank you! You and Violet would love this.